PE Hans Jaeger gave a presentation on his major project 2012 - 2013. "Cataract Surgery for the Needy". This will be a joint project between Rotary Club of Queenstown Singapore and Rotary Club Bogor (Distr. 3410, Indonesia). 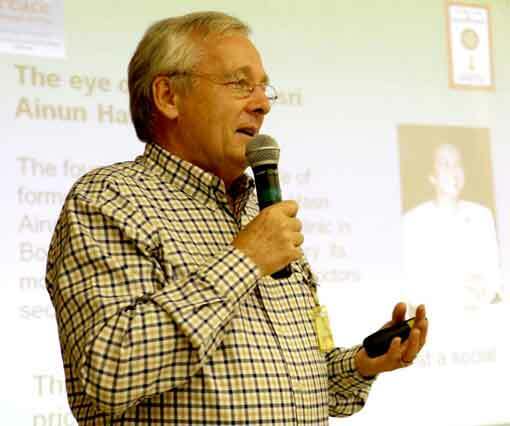 The medical partner in Indonesia is the Eye Clinic "Dr Ainun Habibie" in Bogor. Fund raising activities are required to achieve the targetted SGD 45,000 for this project. Several rotarian have agreed to go with PE Hans to Bogor in November to visit the hospital and the Rotarians from the Rotary Club of Bogor. There are plans for good fellowship and a golf game. It was mentioned that PE Hans would welcome early notification of fellow rotarians participation in this event so arrangements can be made for the various activities to be organised. 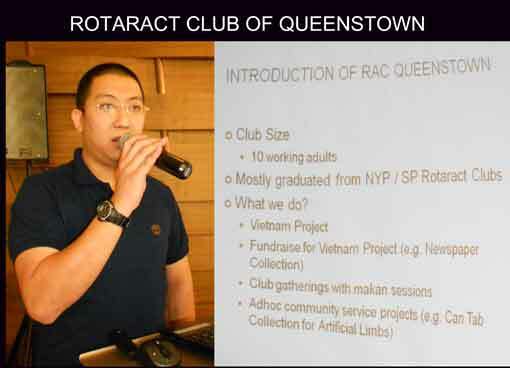 PP Ryan Sim, RI District 3310 Zone 3, Rotaract Club of Queenstown, Singapore gave a presentation on their Club and the upcoming projects they are working on. The Vietnam fundraising project is one where newspapers from different housing estates in Singapore are collected to sell per kilo to the rag and bone man in order to raise the funds.